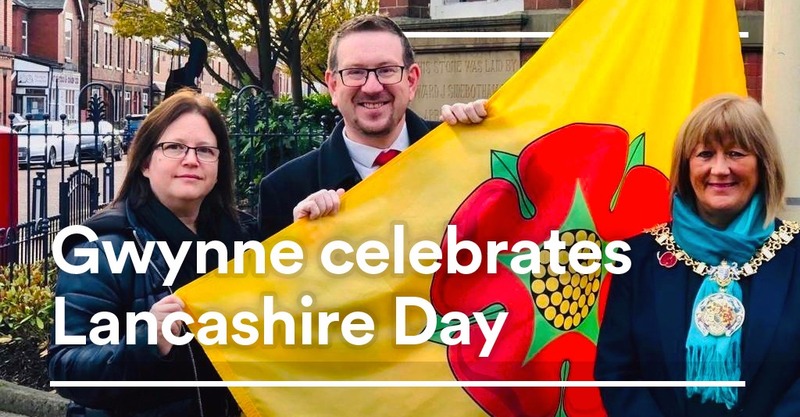 Denton and Reddish MP Andrew Gwynne has joined with Members of Parliament and Civic dignitaries from across the historic County Palatine of Lancaster, to celebrate the 27th November as Lancashire Day. 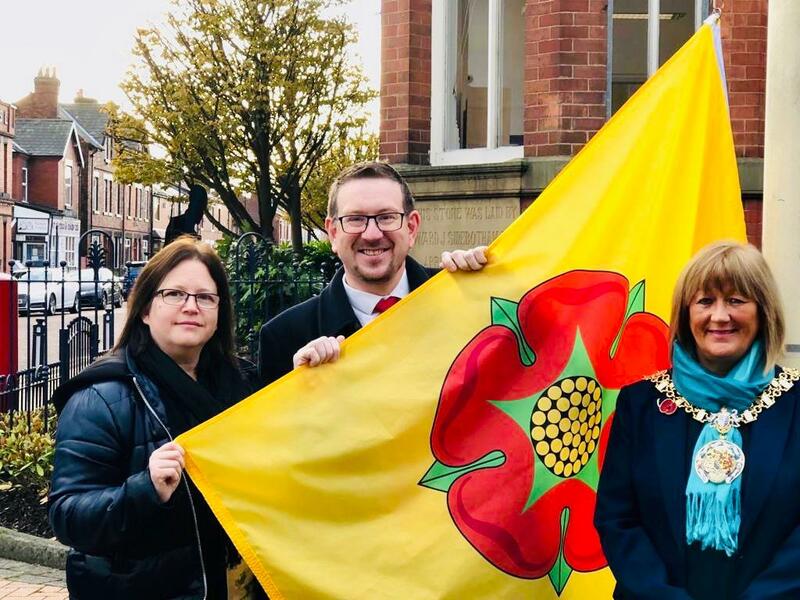 Before heading down to Parliament, he teamed up with the Civic Mayor of Tameside, Cllr Denise Ward, and Denton North East Councillor Allison Gwynne, to raise the Lancashire Day flag on Denton Town Hall’s flagpole. The 27th November is an important date. On this day in 1295 the first elected representatives from Lancashire were called to Westminster by King Edward I to attend what later became known as “The Model Parliament”. Although the administrative boundaries of Lancashire have been altered a number of times throughout history, the most radical being in April 1974 as a result of the Local Government Act 1972; most people are not aware that the Duchy and County Palatine of Lancaster remains as a legal entity and administrative unit. Both the towns of Audenshaw and Denton (which was unified with Haughton in 1884) were jointly administered by their respective Urban District Councils and the Lancashire County Council right up until March 31st 1974. Reddish and the Heatons were transferred to Stockport in 1901, as the only parts of ‘historic Lancashire’ to be put within the then County Borough of Stockport. “County of Lancaster” can still be made out in the stonework on the old Reddish police station – although Lancaster has at one time been chiselled off – and Lancashire Hill gets its name from being located on the Lancashire side of the Rivers Mersey and Tame. “Lancashire Day is a fantastic opportunity to celebrate our rich heritage. The Lancaster Day tradition goes back to 1295, and was first celebrate when the very foundation of our present day democracy were being laid. It’s great that once a year we can set our modern allegiances to one side and enjoy the 900 years linking Audenshaw, Denton, Haughton, Reddish and the Heatons to the historic County Palatine of Lancaster. “And of course, not many people realise that even today the County Palatine survives as a legal entity for certain functions. The Lords-Lieutenant and High Sheriffs of Greater Manchester and Merseyside, as well as of Lancashire, are appointed by the Queen as Duke of Lancaster, not as Sovereign of the UK. They are County-Palatinate appointments. Likewise, if an estate is left intestate because there is no will, it is transferred to the Duchy of Lancaster for disposal, rather than to HM Government. All local peculiarities because of the County Palatine and Duchy. “To the people of the city and county palatine of Lancaster. Greetings! “Know ye that this day, November 27th in the year of our Lord Two Thousand and Eighteen, the 66th year of the reign of Her Majesty Queen Elizabeth II, Duke of Lancaster, is Lancashire Day. “Know ye also, and rejoice, that by virtue of Her Majesty’s County Palatine of Lancaster, the citizens of the Hundreds of Lonsdale, North and South of the Sands, Amounderness, Leyland, Blackburn, Salford and West Derby are forever entitled to style themselves Lancastrians.